The early stages of this year’s Wimbledon Tennis are already underway, with hopefuls from around the world battling it out for the chance to get crushed by a big star name later in the draw. There are a huge number of matches, and anyone with real expertize could undoubtedly find some value bets. This page takes an alternative perspective – looking at the special offers available before the final stages take place. There are some good deals, and remember that for those who do not yet have accounts, these tennis specials are in addition to the regular welcome bonus offers. Note that these offers are for worldwide readers, if you are from the US, there are some great offshore betting sites which offer big welcome bonuses in addition to their promotions – you can check the list in this article. Live betting is all the rage these days, and you can win a share of €10,000 just by betting ‘in-play’ at Wimbledon. This is not complicated, especially as there are plenty of breaks between games and sets when you can assess the odds and get a bet on. A lot of people will get paid in this promo, which comes on top of the € / £25 risk-free bet that all new players enjoy. Bonus tip: If you place an Live Bet using your mobile phone (very easy with the Unibet app), you’ll get double points towards this promo. Check out the details for yourself now over at www.unibet.com. With so many matches (and many with overwhelming favourites) the ‘combo boost’ promo is perfect for Wimbledon betting. This also works with other sports. 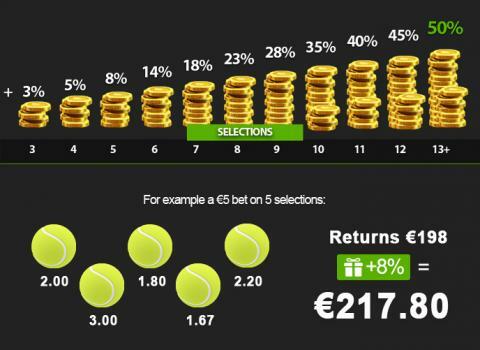 The idea is that you get a bigger percentage bonus the more combinations you add to your betting slip. This is extra money, pure and simple, for example 6 combinations (legs) gets you 12% extra, 10 gets you 35% extra and the top level of 13 gets you 50% more winnings. This is on top of the £ / €50 Free to new customers – check out www.netbet.com for the details! Here is one for those punters who like to bet all the way through (rather than just focus on the big matches and star players). 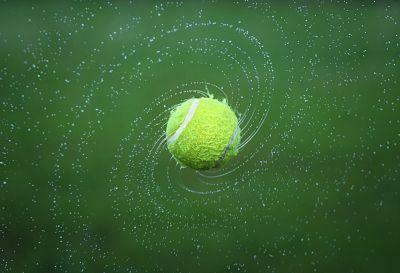 If you keep on betting, then 888 Sport will give you a free tennis bet worth £5 every single day during the tournament. You can find more on this excellent offer at www.888sport.com. There are several more articles focusing on Tennis betting here at High Tech Gambling. Give them a read before you take advantage of the great Wimbledon Tennis Betting promos above!